The Lake Havasu Area Chamber of Commerce held a ribbon cutting ceremony for Spice Boutique, celebrating its grand opening and new Chamber membership. Attending the ribbon cutting from left to right were Eileen Reed, Haile Gisel, Julie Garcia, and Bob Keller. 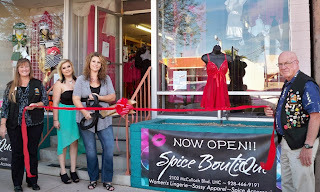 Spice Boutique offers, dresses, lingerie, and other apparel ranging from sizes XS-6XL. Spice Boutique offers a modern approach to an ancient art, with a dash of class and a pinch of sass; Spice Boutique is a couple's wonderland. For more information visit them at 2102 McCulloch Blvd. Mon-Thurs 10am-6:30pm and Fri-Sat 10am-8pm.